Preheat oven to 425F. Melt butter and whisk in flour to make roux. Heat heavy cream and then add chicken base. Add roux to cream mixture and cook until thickened. Whisk in chicken base and sour cream. Stir in onions and pepper. Put mixed cheese and potatoes in a cooking dish. Pour cream mixture over and stir in. Sprinkle lightly with corn flakes. Bake for about 30 minutes or until internal temperature is 160F. Alternatively: Portion out in smaller serving dishes. Sprinkle with corn flakes. Put smaller dishes on baking sheet and bake at same temperature for about 10 minutes. Guests Say Visit Was "Pure Delight"
In a small saucepan, combine the sugar and cream and bring to a boil over medium heat, stirring occasionally. Reduce the heat and simmer for 6 minutes. Add the chocolate and butter and stir until melted. Pour into a bowl and stir in the vanilla. Let the frosting cool, whisking gently from time to time. Don’t overwhip or you’ll create air bubbles. Preheat oven to 350F. Lightly butter the bottom of two 9-inch round cake pans. Line the bottom with parchment paper, then butter and flour the parchment and the sides of the pans. Combine the sugar, flour, cocoa, salt, baking powder, and baking soda and mix on low speed. Mix in the eggs, oil and milk. Increase the speed to medium and beat for 2 minutes. Reduce the speed to low and mix in the water. The batter will be soupy. Divide the batter evenly between the cake pans and bake for 30-35 minutes or until a toothpick inserted in the center comes out clean. Remove from the oven and cool on a cooling rack for 5 minutes and then turn the layers out onto the rack and cool completely. Frosting the Cake: When the cakes have cooled, check the frosting. It should have the consistency of mayonnaise. If it is still too thin, allow it to cool longer. We are back home again since the day before yesterday. Lucky, very lucky we were that we had the chance to stay at Buckhorn Inn! What a wonderful week! We would like to thank you very much that you made it possible for us to stay some days longer as we had intended to do, all in all 7 days (June 05 – 12). Many thanks for your exceptional hospitality. Accommodation and service were excellent. Our very best “Dankeschön” to all the staff. They were competent, friendly and helpful – always. Breakfast and dinner were delicious as were the cakes in the afternoon. We met many other guests and enjoyed talking to them. 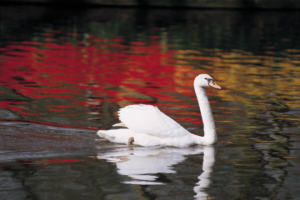 We shall not forget this calm and peaceful atmosphere within your hotel as well as outside. The nature trail is something very special, a treasure. We enjoyed our walks and loved sitting at the pond and on the bench in front of the labyrinth. Our thoughts “flew away”, if I may say so. Buckhorn Inn was the right starting point for very interesting excursions to some of the famous attractions of the Smokies. This park is gorgeous! It had been a must to spend some days in this wonderful surrounding. Yes, we saw some bears! Very close to us. We took photos. As I said above, all in all a WONDERFUL TIME! Preparation Process first 3 ingredients in a food processor until finely crushed. Firmly press mixture onto bottom of a lightly greased 10-inch springform pan. Bake at 350° for 10 minutes. Cool completely in pan on a wire rack. Let vanilla ice cream stand at room temperature 20 minutes or until slightly softened. Process strawberries and 2 tablespoons powdered sugar in a food processor until pureed, stopping to scrape down sides; remove strawberry mixture, and set aside. Process blueberries and 1 tablespoon powdered sugar in food processor until pureed, stopping to scrape down sides; set aside. Mash bananas with a fork in a large bowl; stir in remaining 1 tablespoon powdered sugar. Set aside. Place 1 quart of ice cream in a large bowl; cut into large (3-inch) pieces. Fold strawberry mixture into ice cream until blended. Place in freezer until slightly firm. Divide remaining quart of ice cream in half, placing halves in separate bowls. Stir blueberry mixture into half and mashed banana mixture into remaining half. Place bowls in freezer. 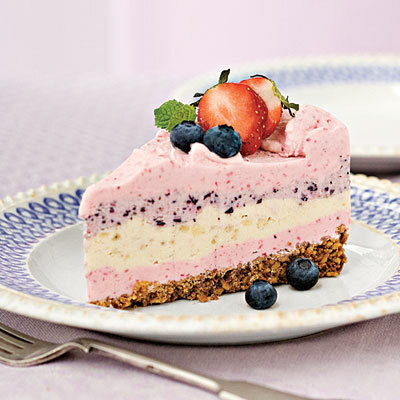 Spread half of strawberry mixture evenly into prepared crust in springform pan. Place pan and remaining strawberry mixture in freezer. Freeze 30 minutes or until strawberry layer in pan is slightly firm. Spread banana mixture evenly over strawberry layer in pan; return pan to freezer, and freeze 30 minutes or until banana layer is slightly firm. Repeat procedure with blueberry mixture. 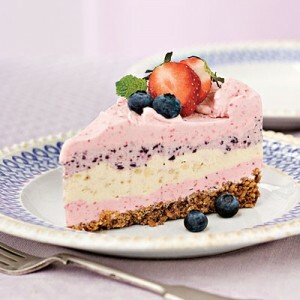 Spread remaining strawberry mixture over blueberry layer in pan, and freeze 3 hours or until all layers are firm. Let pie stand at room temperature 15 minutes before serving. Garnish if desired. Preheat oven to 375F. In a food processor, puree the apples with a little buttermilk. In a mixing bowl combine sugars, oil buttermilk, eggs, vanilla, molasses, apples and cinnamon. Add the flour and walnuts and mix. Place in a greased 13×9 pan. Top with the streusel and bake about 40 minutes or until a toothpick comes out clean. In a food processor, combine first 4 ingredients. Add butter a little at a time until the topping comes together slightly. Bring chicken stock to boil. Add chicken breasts and simmer until cooked through—about 15 minutes. Transfer chicken to a plate. Reserve poaching liquid. (If you don’t have 3 cups remaining, add more chicken stock.) Shred the chicken and set aside. Remove and discard husks from the tomatillos. Rinse and coarsely chop. Put tomatillos in a large bowl and add onion, cilantro, garlic and jalapeño. In a food processor, process half of this mixture with ½ cup water until chunky. Repeat with remaining half of mixture and another ½ cup water. Place the tomatillo mixture in a large, deep-sided pot. Add the reserved chicken poaching liquid, shredded chicken, hominy and oregano. Simmer and cook until all ingredients are just heated through—2-3 minutes. Taste soup and season with salt as needed. To serve ladle soup in 6-8 soup bowls and add garnishes. Gatlinburg’s popular River Raft Regatta takes place at noon on Monday, July 4th, on the Little Pigeon River in Downtown Gatlinburg. Art, crafts and music lovers can find almost 200 booths featuring some of the nation’s finest work. Artisans and craftspeople are on hand to demonstrate their skills, answer questions and offer their unique art for sale. Live Country & Bluegrass entertainment. Open 10 a.m. to 6 p.m. daily, Sunday 10 a.m. to 5 p.m.
Saluting the valiant men and women of our military services, this 36th annual showcase is the “First July Fourth Parade in the Nation!” Parade starts at the stroke of midnight to begin Independence Day. Rubber sharks are released into the Little Pigeon River at the Christ in the Smokies Museum and Gardens bridge to race downstream, first one to cross the finish line wins! Offering local choices for healthy mountain living, the Gatlinburg Farmers Market is open each Saturday from 8:30 a.m. to 11:30 a.m. in the Alamo Steakhouse parking lot at 705 East Parkway through October 21. Whether you’re a home decorator or professional, Christmas Expo has something for you. See new lighting products and decorations at this FREE trade show, or register to attend a how-to-class or seminar. Listen to the spirits of Cades Cove while enjoying a night-time walk in the cove. Distance: 2.5 mile walk rated easy in difficulty. Summary: Come along with a ranger for a guided walk up to Laurel Falls just before sunset. 2.6 miles roundtrip hike rated moderated in difficulty. Click here for more info. Summary: Learn about the return of the elk to the Smokies with a guided hike to the elk acclimation pen. Hike distance: less than one mile, rated moderate in difficulty. Summary: The sound of water is music for the soul. Join a ranger and experience the melody of the mountains. Two-mile round-trip hike rated moderate in difficulty. Click here for more info. Summary: Round up the kids and get your blood pumping on a brisk walk along the West Prong of the Little Pigeon River to learn some secrets of the natural world. Hike rated moderate in difficulty. Summary: Geology, old-growth trees, and panoramic views await you while joining a park ranger on one of the most diverse hikes in the Smokies. Wear sturdy shoes; bring water and a snack. Hike rated moderate to strenuous in difficulty. Click here for more info. Summary: Hike with a ranger through an old growth forest to one of the most popular waterfalls in the park. Hike rated moderate in difficulty. Click here for more info. All hikes are free. For more information, please visit the GSMNP event page.